JOSÉ MATEO BALLET THEATRE’S HOME, OLD CAMBRIDGE BAPTIST CHURCH, IS A FOCAL POINT IN THE HARVARD SQUARE HISTORIC DISTRICT. THE FACILITY HAS BEEN LISTED ON THE NATIONAL REGISTER OF HISTORIC PLACES SINCE 1982, ON THE MASSACHUSETTS REGISTRY OF HISTORIC PLACES AND IS A CONTRIBUTING FEATURE OF THE MID-CAMBRIDGE NEIGHBORHOOD CONSERVATION DISTRICT. The facility is an outstanding example of the American Gothic Revival style of architecture. Designed by noted Boston architect Alexander R. Esty and erected between 1867 and 1870, the facility boasts soaring 50-foot ceilings, an important collection of 19th and 20th century stained glass, expansive interior spaces and the tallest cut-stone spire in Middlesex County. Built of local fieldstone and granite quarried in Somerville, Massachusetts, the building is a notable example of the muscular use of stone, typical of American Gothic Revival architecture. This solidity, coupled with Esty’s display of structural strength in the asymmetrical massing of forms, is further accentuated by the contrast between heavy gray stone and large, graceful, delicate stained glass windows, which the stone walls simultaneously reveal and protect. In 1897, the original Parrish Hall was lost in a fire. The rebuild was under the direction of noted Boston Theater Architect, Clarence Blackall. The most notable feature of the reconstruction is an 1890 Tiffany & Company Window. This early Tiffany window bridges the gothic stained glass tradition and emerging art nouveau movement. 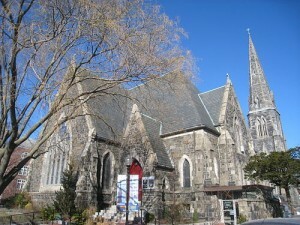 In July 2000, the congregation of Old Cambridge Baptist Church and José Mateo Ballet Theatre embarked on a partnership designed to provide the ballet with space for teaching, rehearsing and performing and to pool the financial and human resources of both organizations to advance the ongoing restoration and conservation of this facility. Six and a half days a week, José Mateo Ballet Theatre’s dancers, teachers, musicians and students (ages 3 – 80) fill Studio 1 (The Sanctuary & The Sanctuary Theatre) Studio 2 (The Parrish Hall), Little Sister Studio and Studio 4 with music and movement. On Sunday mornings, these same spaces resonate with the praises, prayers, and preaching of the congregation. Our shared use of spaces, for both dance and worship, is symbolic of the parallels of the loftiest aspirations of dance, and the earthiest intent of worship. Today, Old Cambridge Baptist Church is a vibrant place where art finds sanctuary and worship finds studios for the practice of the arts of spiritual life. Currently, the National Trust of Historic Preservation is developing a case study citing the development of José Mateo Ballet Theatre’s home as one of the best examples of the adaptive reuse of a House of Worship in the United States. Since its inception the project has benefited from the vision, expertise, and dedication of Brad Bellows, a Cambridge Architect.